The highly-anticipated Apple HomePod is rumored to be launching in February and in the lead up to the big date more details have been revealed about the smart speaker’s settings. Today, French tech site iGeneration shared a series of images which it says are obtained from employees in France and Germany taking part in internal testing. The screenshots suggest that there won’t be a dedicated HomePod app, but instead you’ll be able to change the settings for the speaker from within the Apple Home app for iOS. The screenshots provide an insight into what some of these settings could potentially be at launch, including turning on and off HomePod’s LED touch interface when it’s not in use, pressing the interface to speak to Siri, and changing Siri’s sound effects. According to the screenshots, there’ll be lots of settings related to accessibility that you can change too, like the pressure sensitivity on the HomePod’s buttons and speed of voice. As well as screenshots, iGeneration also shared a photo of the surface of the Apple HomePod, which appears to not only display an animation of Siri, but volume controls as well. Interestingly, there don’t seem to be any settings that hint at multi-user support, a feature that iGeneration wrote about in December that would allow the HomePod to differentiate between its owner and other voices in your family. It's worth noting that multi-voice recognition isn't a feature that's been confirmed by Apple either. 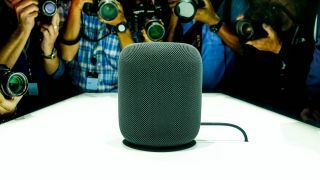 Apple’s HomePod was first unveiled at its WWDC 2017 convention in June 2017 and was first expected to be released last December 2017 but faced delays. Now the Apple HomePod is expected to go on sale in February after news broke over the weekend that the smart speaker gained approval from the US Federal Communications Commission (FCC). However, there’s been no official confirmation from Apple just yet about that release date. We were able to get an up-close look at the Apple HomePod after Apple’s WWDC keynote, but we weren’t allowed to touch it or interact with it. We were able to size it up and listen to an audio demo, though, which proved to be of a really high standard that we thought was easily a match for Sonos' famed speakers.